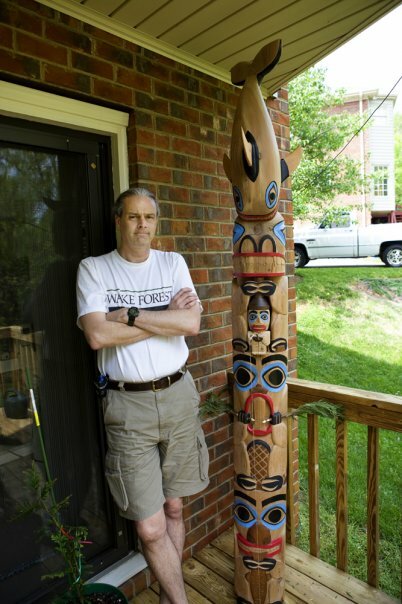 The totem pole above is a 6-foot basswood carving. 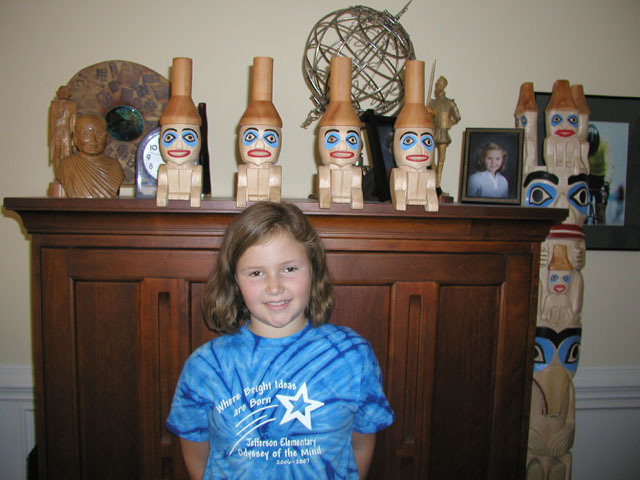 It was formally raised in August of 2006 at a Potlatch--a native festival dedicated to sharing. 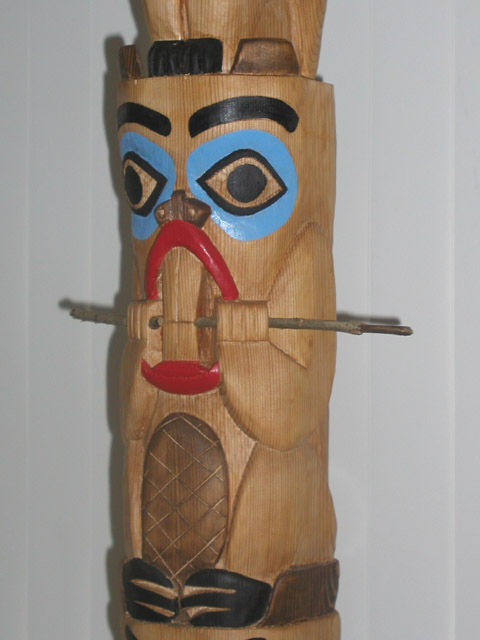 A totem pole raising is typically part of a Potlatch. 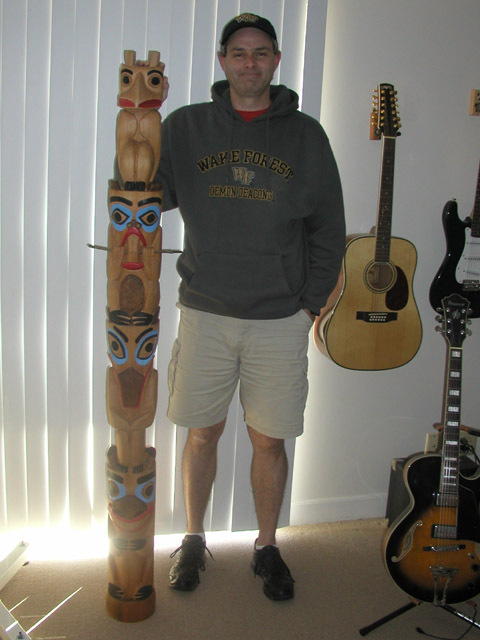 The totem pole on my left is the 6-foot totem pictured above. 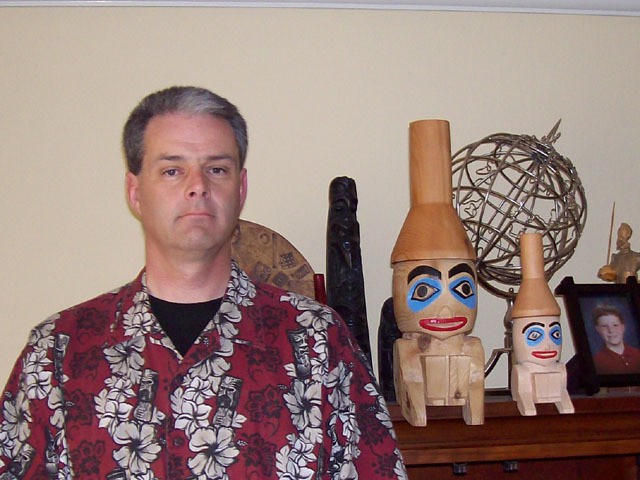 The totem pole in my right hand is a carving from Western Red Cedar. 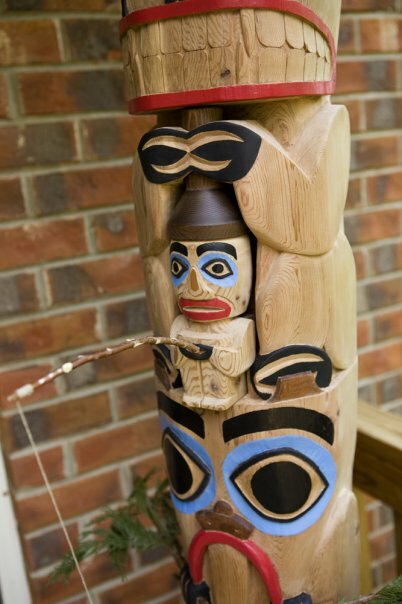 Western Red Cedar is the wood typically used for totem poles in British Columbia. 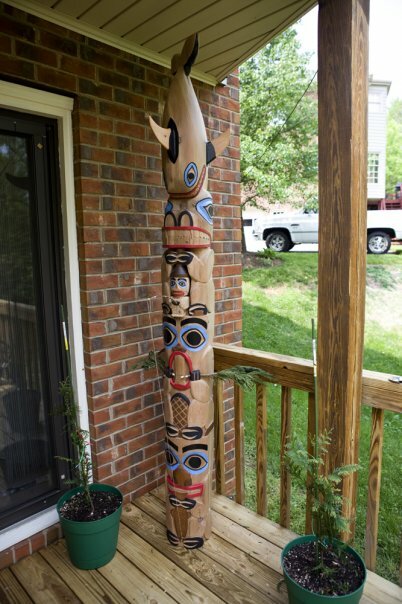 This totem was completed in February of 2007, and was a 50th anniversary gift for my in-laws. 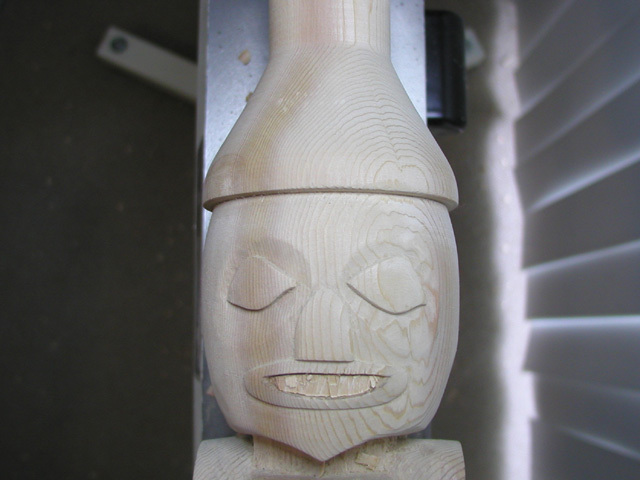 Although the cedar carving is smaller than the basswood carving, the cedar carving took longer, as cedar is quite difficult to carve. 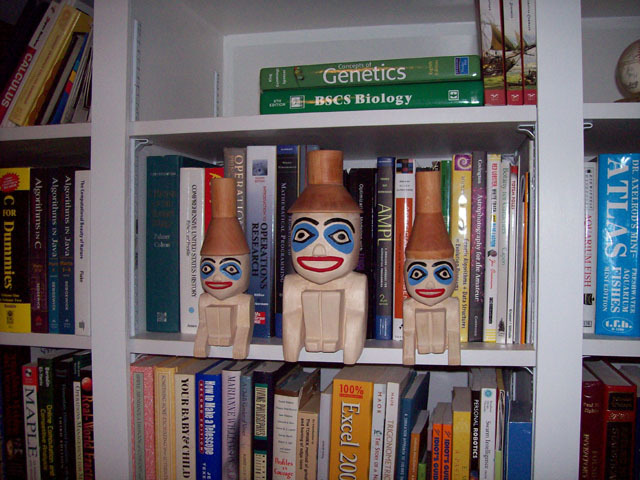 The are The Shelf Men. 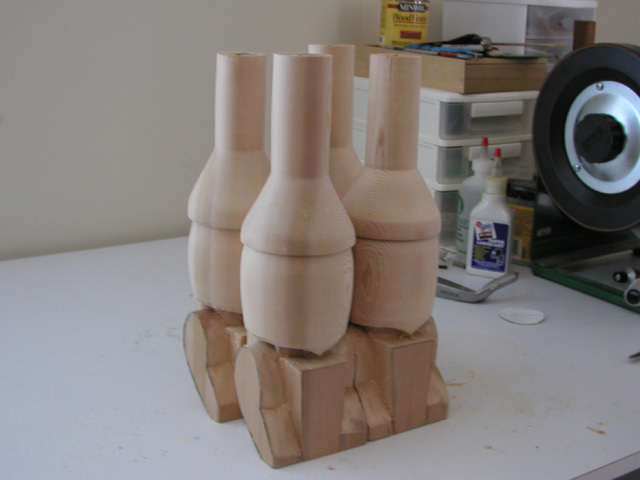 They are all basswood. These gentlemen are intended to protect your best books from being examined by those unqualified to do so. They can also adorn a mantle or entertainment center. 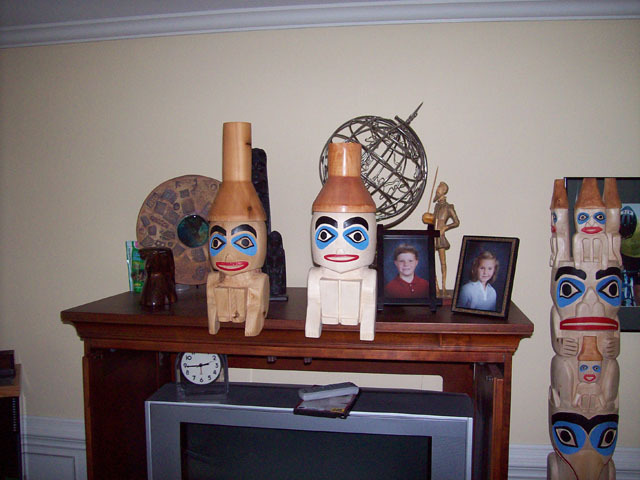 These two Shelf Men are from cedar. The one on the left is Western Red Cedar. The one on the right is Eastern Red Cedar. 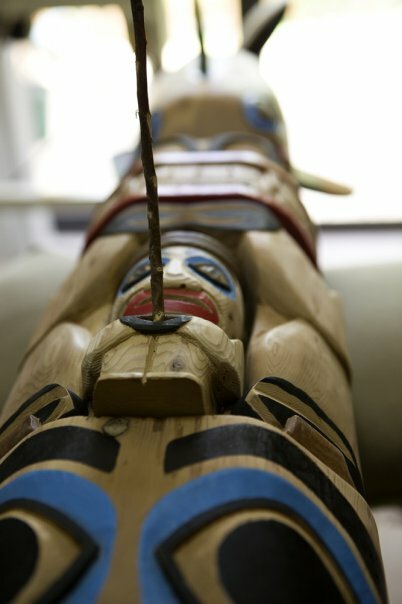 Detail of the Western Red Cedar Carving. 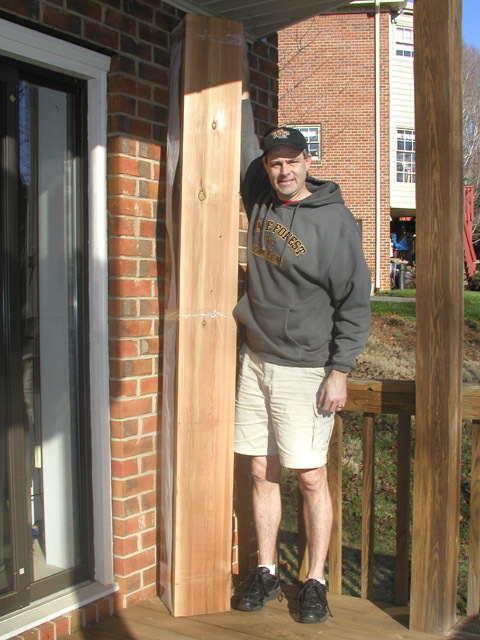 Here's the Cedar Shelf Man next to a basswood cousin. The basswood shelf man was pretty easy to carve. 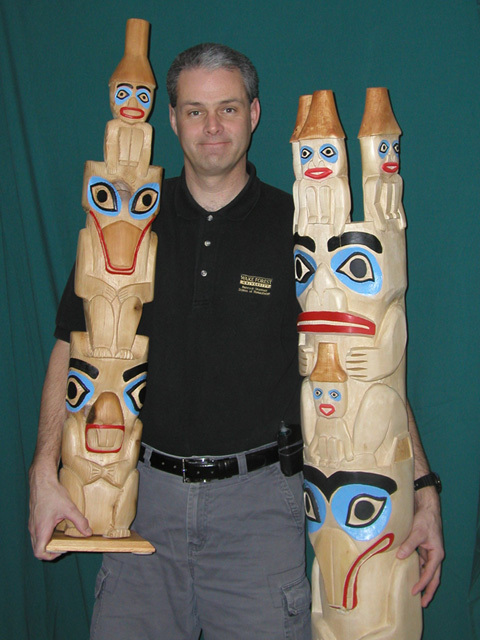 This is totem pole I finished in December of 2007. It is Western Red Cedar. I purchased this wood at a home improvement store in Indianapolis earlier that year. This carving took about three months to complete. The beaver and raven were the hardest parts. Here's detail of the beaver (from the above carving). Here's a raven I finished in March, 2008. This carving was auctioned off at a charity auction hosted by my college. 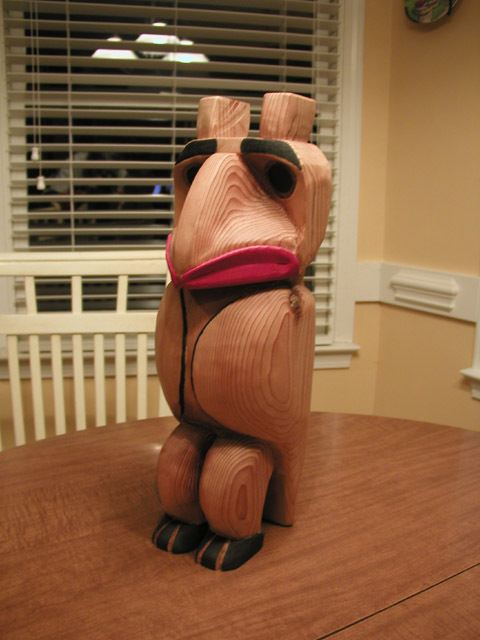 Here's a beaver I finished in April, 2008. 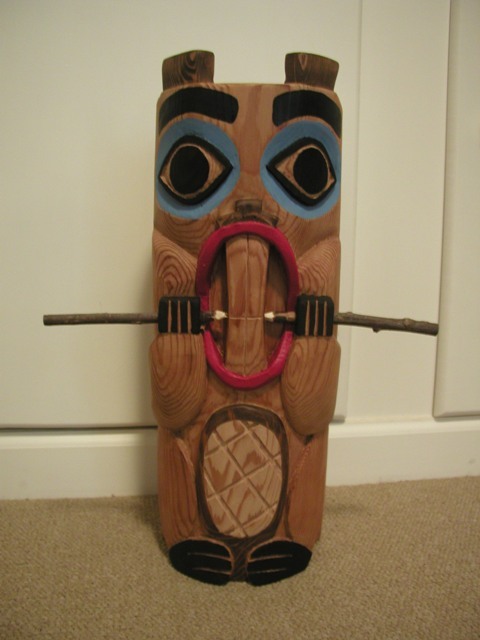 This carving was auctioned off at a charity auction for my daughter's grade-school. January, 2008: This is an 8-foot Western Red Cedar post that I special ordered. The wood was harvested in British Columbia. 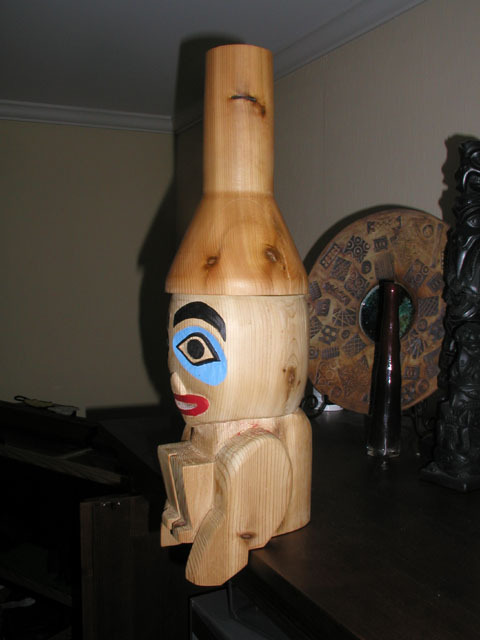 The intent is to carve a totem pole in the spirit of the Haida tribe. November, 2008: This is cedar post above in process. At this point, the roughing our process has been completed. The new few months will be detail carving, painting and finishing. 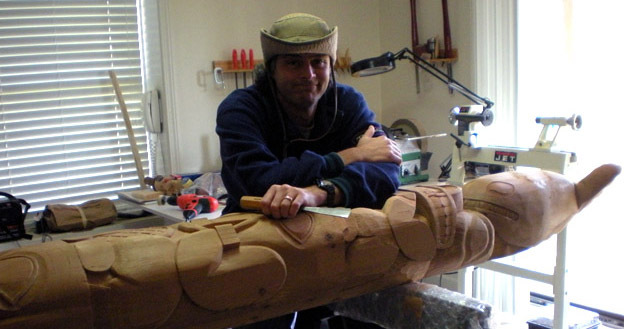 I hope to have the totem completed by April, 2009, at which time I will be hosting a potlatch (a party with a totem-pole raising). 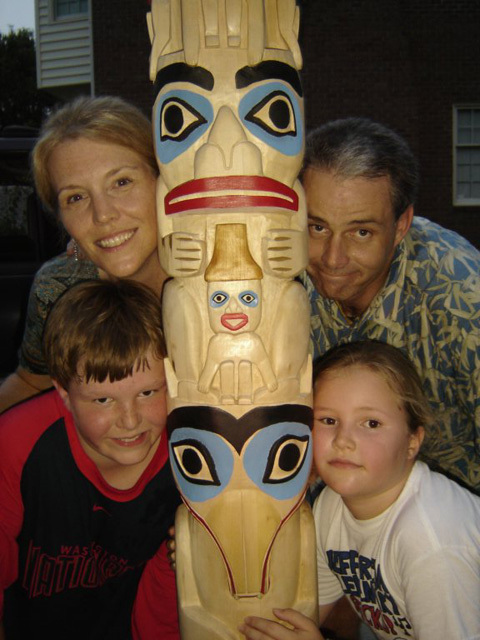 May, 2009: Totem pole completed -- one year in the making. May, 2009: Detail of tribal elder and fisherman. May, 2009: Another view -- 8 feet tall. May, 2009: A view from the bottom.